I have to say that Ponces is one of my favorite Mexican restaurants in San Diego, other than the little taco shops. It is a family-owned restaurant and the prices are very reasonable, especially when you visit during the work week for lunch. When I worked in Kensington back in college, my boss came here just about every day for their lunch specials. Read about my previous experience here. We ventured out to Kensington on a Saturday afternoon and I was excited to introduce Ponces to my hubby and toddler son. I love Mexican restaurants that start out with complimentary chips and salsa. 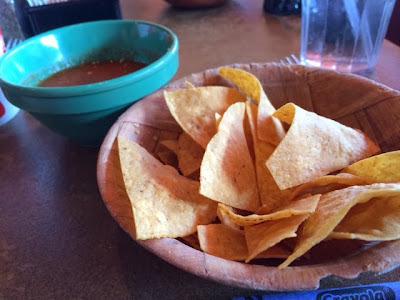 The tortilla chips tasted really fresh and we were given the red salsa and salsa verde (not pictured). Our son loved the salsa verde because he kept dipping the chips in it. I love how he likes to try new foods. 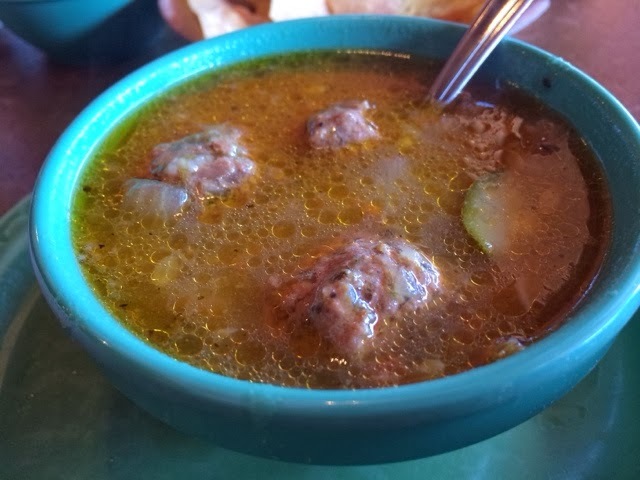 The last time I was here, I ordered a cup of the albondigas (meatball soup) ($3.15). 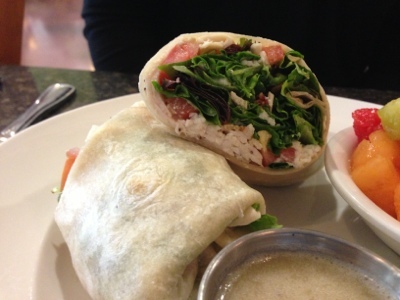 I had to order it again because it is so flavorful and delicious. The broth in the picture above has a lot of oil specks... while it does not look visually appealing, it was certainly yummy. There were plenty of hearty meatballs in my cup and vegetables (zucchini, carrots). My son enjoyed the soup too. We started off with the crispy quesadilla ($4.95), a.k.a. cheese crisp. Our son got all excited when it was served to us and called it a pizza. 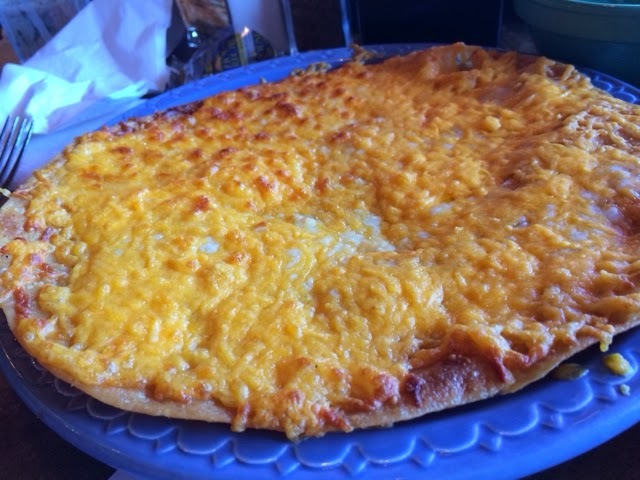 It was a deep fried tortilla topped with cheddar and monterey jack cheeses. Mmmmm. Simple goodness. My new thing at sit-down Mexican restaurants is to not focus on the combination plates - because I seriously eat with my eyes. 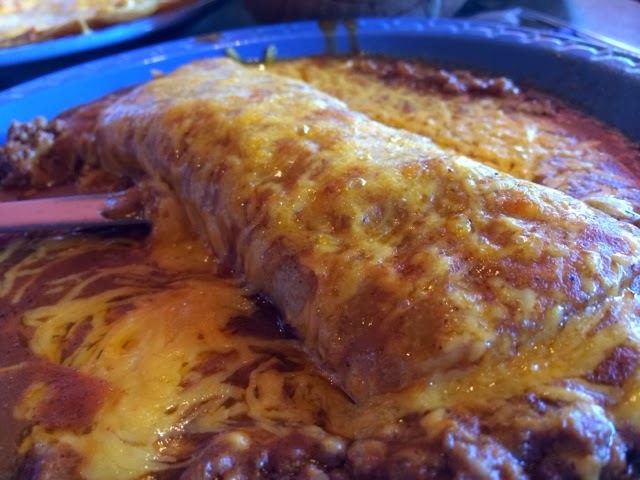 Because I am in love with their enchilada sauce, I ordered a single ground beef enchilada ($3.95). 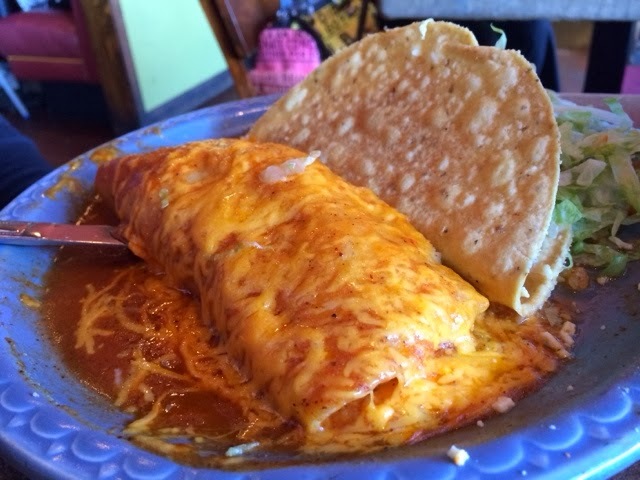 Look at how the enchilada was swimming in their savory sauce with tons of shredded melted cheddar cheese around it. I dipped the tortilla chips in the sauce. Oh my. 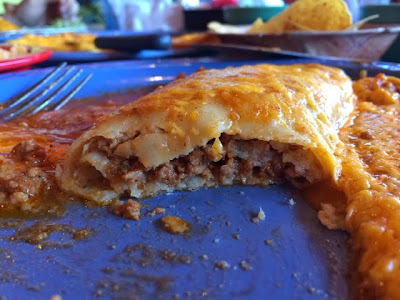 The person at the table next to us ordered a ground beef enchilada and it reminded me of a Mexican lasagna and it looks absolutely amazing. I had to try it. It was really good. The meat was seasoned perfectly and it truly was like a different type of lasagna. Ponces is a gem. The servers are super friendly as they make you feel like a part of the family. Here is the link to their menu to see what other delicious dishes they serve.... but you know why I will be back, for their albondigas and enchiladas! 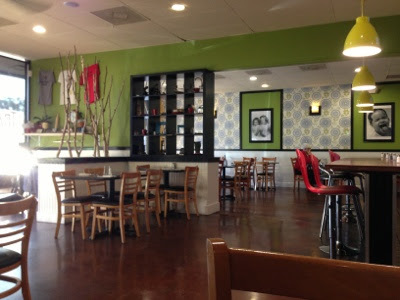 I had no idea that The Trails Neighborhood Eatery existed until I saw an episode of Food Network's Restaurant Impossible. Chef Robert Irvine helped the restaurant's owner, Stacey, and re-decorated her cute, little restaurant in San Carlos to boost her business. He even convinced her to open for dinner, which they are open from Wednesday through Saturday, from 5-9pm. 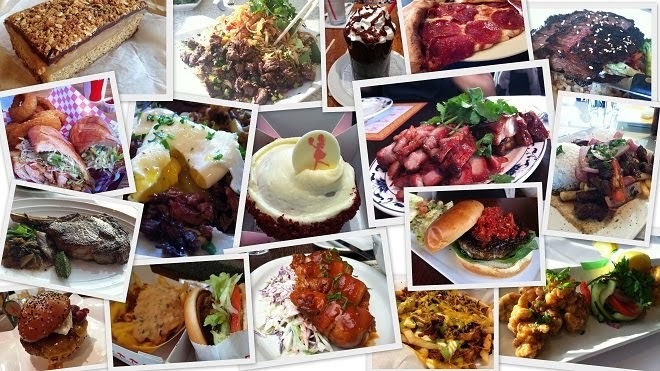 The hubby and I exactly did that, visited for a really early dinner, at 5pm before a work event in Mission Bay. My best friend visited a short while back and she raved about their cinnamon roll pancakes and even met Stacey herself. Knowing they served their pancakes even for dinner, we were excited to try a new place. The Trails is located in a strip mall in San Carlos. We arrived a little around 5:30pm with only a few patrons already in the restaurant. The decor is simple and clean. I love the shade of green on the walls and the overall color scheme. Both M and I started off with their house salad ($4.00). 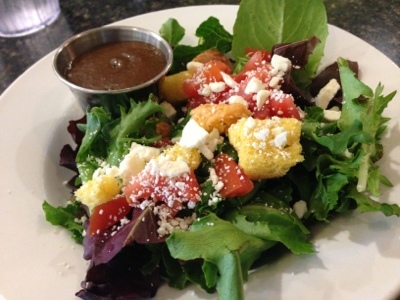 It came with baby greens, tomatoes, croutons, and crumbled feta cheese and their house vinaigrette, which is a creamy balsamic. Yum. Simple and fresh, like the decor. It was a nice way to start the meal. 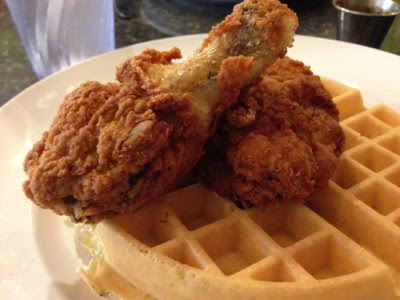 There is something about chicken and waffles ($10.00) that makes me gravitate towards them when I see it on a menu. 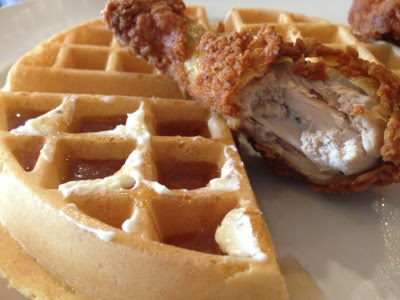 I just love the "comforting" thought of crispy, savory fried chicken and a sweet waffle with butter and syrup. I caved in and ordered it. My chicken and waffle entree arrived piping hot -- dark meat is my favorite - moist and flavorful chicken - the skin was crispy and perfectly fried. The waffle was fresh, crispy and had a hint of vanilla in there. I also received a side of Louisiana hot sauce for my chicken. 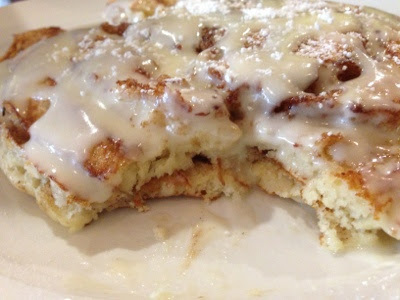 These cinnamon roll pancakes were so good, that I will come here anytime to have these gems. Gosh, I love savory foods over sweets any day, but this seriously is TO DIE FOR. The ooey-gooey icing with the hot, fresh cinnamon flavored pancakes were such a wonderful combination. You really have to experience for yourself. It was amazing. So, we knew we wanted the pancakes for dessert and saw on their menu that they have them listed as "cinnamon roll pancake a la mode" for $5. When our server asked us if we wanted dessert, we said we wanted to try the famous pancakes and he responded with, "Sure... with bacon?" And, we answered with, "Ummm.... no bacon, please." 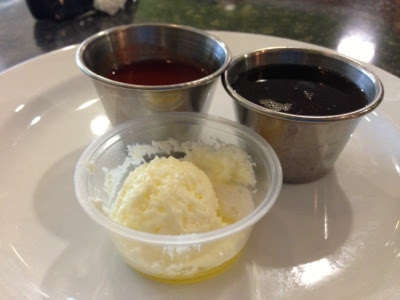 He brought us that goodness pictured above, but when the bill came... he, in fact, charged us $9.50 for the pancakes, the price of the full breakfast. Oh, well... it is our fault for not clarifying with him, but whatever. The deliciousness of the pancake made up for the miscommunication and/or lack of communication from both ends. Haha. Guess we should have ordered the bacon that comes with it, but we would probably be have to be rolled out of the restaurant. 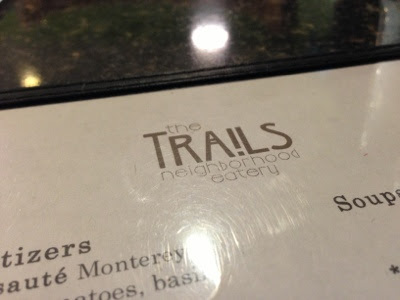 The Trails Neighborhood Eatery is a must try if you are in the San Carlos area. They are located in a little strip mall. 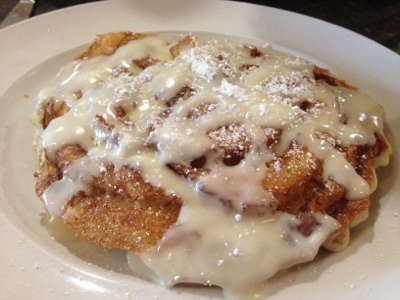 We will be back, for sure, for these cinnamon roll pancakes. YUM.